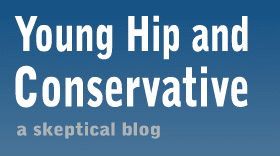 Young, Hip and Conservative: a skeptical blog: Is it hypocritical to use a program you oppose? If a person leaves one job for another job, whether that new job is of a lesser or higher pay than the old one, she doesn’t take the difference in wages between the two, and count that as what she is making. If her old job paid 20.00/hr, and her new one 21.00, she wouldn’t think of her new job as only making 1.00/hr. It would be what it is: 21.00/hr. While it is true that the cost of something is what you give up to have it, to simply take the monetary difference between the two jobs/employment states into account is not enough. There are other factors involved that are non-monetary, non-concrete factors. In fact, the only legitimate consideration to take into account would be the amount of satisfaction provided by the one over the other. In comparing the unemployment benefits that paid 300.00/week with the job that paid 400.00/wk, getting 100.00 more a week would certainly provide some satisfaction. The feeling of self-respect and the garnering of the respect of others would provide additional satisfaction. Then there are such things the quality of enjoyment of the job, career-enhancing opportunities it enables, pleasant work environment, and fringe benefits. With all these things factored in, the new job might be worth much more than the old one. Your example ignores the important transition from working to not working. Your $20/$21 example is going from one job to another, possibly 40 hours to 40 hours a week. My example goes from working zero hours a week to 40. Your reliance on pride and self esteem to get people to work sounds like the framework for a command economy. That's been tried before, but those systems ended up relying on bullets and gulags to inspire people to work instead. I'm just saying there are other job compensatory factors that are non-monetary ones, that are the most relevant ones, namely job satisfaction. The fact that our society places a stigma, however right or wrong, on being unemployed, creates dissatisfaction in life, caused by lowered self-respect. This dissatisfaction must be factored in as what that job is actually worth. I think it might be completely rationale to be a hypocrite, but collecting money from a system you don't believe in, and don't believe others are entitled to, smacks of hypocrisy. I don't think it can hide behind a label of rationality . . . But I suppose your retort would be either 1) I don't care that it's hypocritical because it it's to my benefit; 2) i don't care that it's hypocritical because hypocrisy doesn't undermine by contention that unemployment wages are bad; or 3) it's not hypocritical. If you became ill and couldn't work would you collect disability? Sounds like you would. If said illness forced you into bankruptcy and you lost your house, would you accept section 8 housing/payments? If said illness/bankruptcy left you homeless and unable to work, would you accept welfare? I am not trying to be flip, I would truly like to know what you would do. And I do think that accepting unemployment undermines your argument against it; as does accepting pork for your district while espousing some type of conservative moral high ground. Eating your cake and having it too? I don't think you understood my central example, as all of these amount to the same thing. In effect, I was forced to buy a bad insurance policy - unemployment. I didn't think the payments I was forced to make were low enough to line up with the amount in the unemployment checks. I also have a problem with the incentives this program introduces. However, I was not given a choice and had to pay for it. While on unemployment, I was opposed to expansions and extensions to the program. Isn't this the opposite of hypocrisy? I think true hypocrisy would be to oppose these programs, but once going on them to advocate for their expansions or to turn around and argue in their support. Thanks for the link Michael. If I'd seen this before, I'd feel guilty for copying the idea; thankfully I hadn't so I guess great minds, and all. 1) Jennifer, you refer to other compensatory factors, but what about additional cost factors. Returning to work has a cost, perhaps in day care or gasoline. Anyone switching from unemployed to employed must incorporate those additional costs simply to break-even on a new job. 2) The expiration of benefits will also be a factor. If my benefits expire in 30 days, I'm more inclined to take the next job I'm offered than if I have 6 more months of benefits coming. In that case, I'll wait for the job I want at the pay I want before leaving the comfort of my home. This is the primary reason indefinite extensions of unemployment benefits are economically damaging.